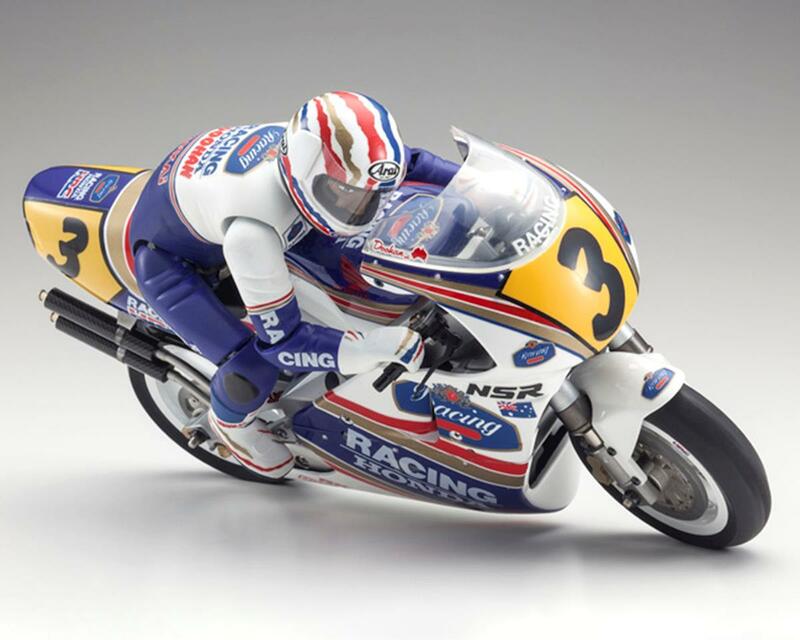 Kyosho Hang On Racer models are the only electric R/C bike with a rider figure than leans through corners! The Kyosho Hang on Racer is still as popular as ever. The S.D.S.S (semi direct steering system) delivers high performance fully independent motion with the rider figure incorporating 13 different articulating joints so it hangs on to the bike as it leans into corners. The result is driving performance just like a real motorcycle that is easy enough for anyone to control. Each section of the bike is designed with an incredible level of scale detail. 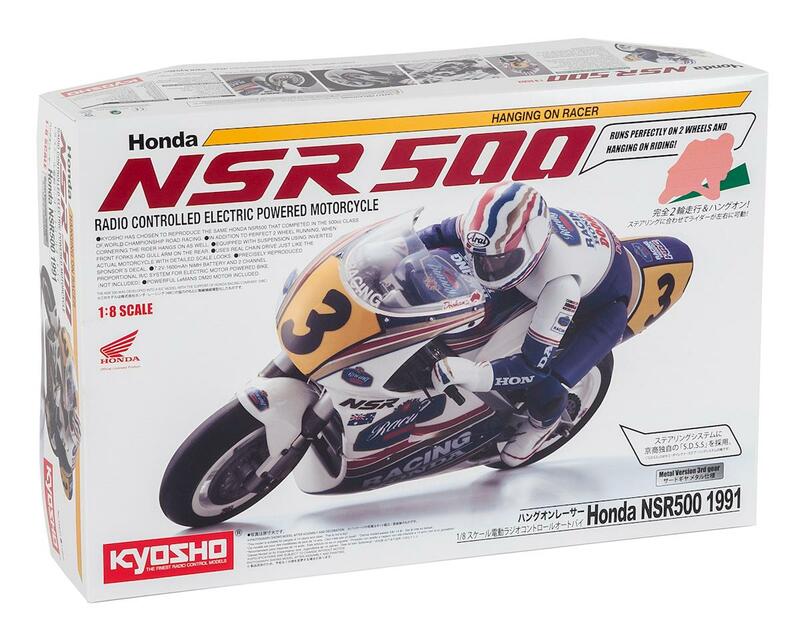 From the body cowl, inverted front fork suspension, brake disk & calipers, wheels, drive chain, sprocket and asymmetrical swing arm - this is an RC model that is packed full of realism that makes it worthy of display. 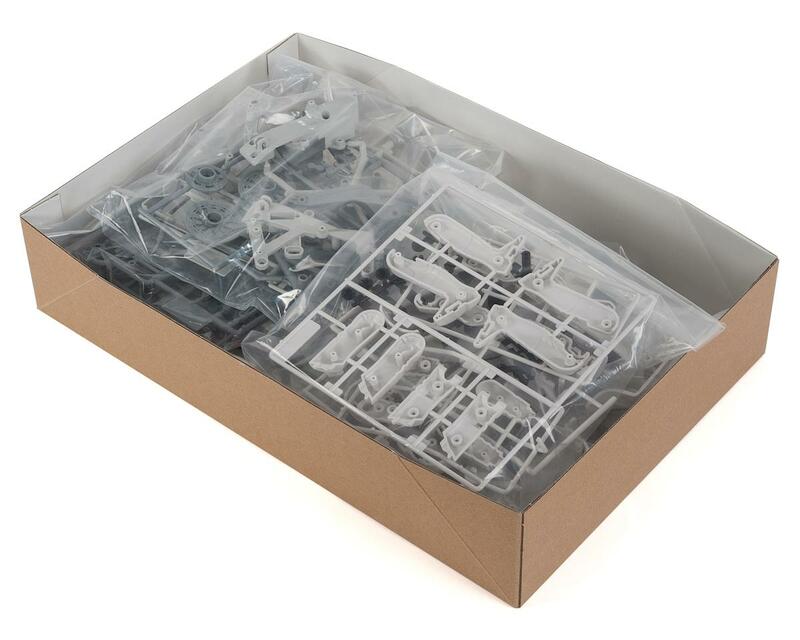 However, as only a few parts are used in construction, even beginners can enjoy the satisfaction of the assembly that only takes a short time to complete. Dive deep into the fascinating realm of R/C electric motorcycles like never before and discover the pure enjoyment of building, displaying and driving your own Hanging On Racer. This is a really detailed and fun motorcycle to run but TAKE YOUR TIME building this kit. The instructions can be quite confusing, especially if you’ve never assembled a RC motorcycle before. I would recommend priming and painting every part before you assemble…at least with the parts that are visible (the brake calipers, rotors, forks, wheels, seat) You will be much happier with it in the end! Another word of advice…Do NOT go with the 2/3 size 7.2v 1600mah nimh battery recommended by some places. Trust me, it will lead to so much frustration that you will want to throw it away. Yes, the battery tray IS large enough however you have absolutely NO room to route the thick, bulky battery wires. The lower fairing will NOT attach if there are ANY wires protruding outside the tray area. Instead, go with something much smaller like a 600-1000mah 2s lipo and use smaller gauge wires with mini (molex) connectors. The motor is tiny and doesn’t require high capacity batteries, you should still be able to get around 10-15 minutes of run time with a 600-1000mah lipo. If you use a lipo battery, you will most likely need to add some weight to the tray (lead clips work great) This is because the model relies on the heavier weight nimh to give it a lower CG…it’s not a problem with some stick-on lead weights though.